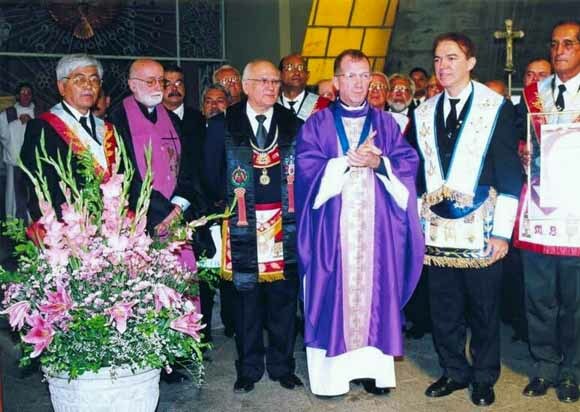 The photo above registers the presence of Freemasons of the State of Pernanbuco, Brazil, surrounding Bishop Bernardino Marchio of Caruaru at his Cathedral after Sunday Mass on December 21, 2008. The attendance of representatives of various Masonic Lodges of the area at that Catholic Cathedral was to pay a homage to the Bishop for his "admirable performance in the government of his Diocese." As the Mass ended, Antonio Ferreira, third from the left, Grand Master of the Grand Orient of Pernambuco, went to the pulpit to praise Bishop Marchio and conferred on him the Masonic Award for Merit of the State of Pernanbuco. Present at the Mass were about 800 Catholic faithful, who witnessed the symbolic event. In his turn, the Prelate delivered a short speech, thanking the Grand Master for the award, calling the event as a "joyful feast" and ending with these words: "So, may the blessings of the Great Architect of the Universe maintain us all as we are now, joyful, united and happy as our Patron taught: Ut unum sint." Among the representatives of Freemasonry was Catholic priest Fr. Aloisio Guerra, second from the left, who is also Venerable Master of the May 13 Lodge. The Catholic Church always taught that Freemasonry was one of her worst enemies; the Conciliar Popes wiped away that objective image. Today Masons are considered just "men of good will." Cui bono? These data and photo were taken from the Catholic blog Fidei Depositum and the website of the Spanish-speaking Masons in New York, here.